My work is symbolic logic. I use movement as a reference, as a signifier. I am interested in déjà vu and an unnamed specificity. Through repetition, simplicity, and humor- I investigate humanity (equality, deficiency, absurdity). My mother was a ballet dancer and my father a painter. I spent my childhood in a studio, creating stories and maps to classical tunes accompanying the dancers. My mother/teacher holds the Maestro Cecchetti Diploma, the PhD of Cecchetti ballet. Through studying this codified syllabus, I began defining an aesthetic in queering logical precise form. There is a makeshift grandness to my work, like a four-act Russian ballet reenacted by neighborhood kids in the backyard. I am interested in formal structures and logical equations. I am interested in displacement and relationality. I am interested in what definitions can reveal, and the freedom exercised in clearly defined systems. Jen McGinn received her B.A. and M.F.A in Dance from Hollins University in partnership with the ADF. She currently teaches at the University of the Arts and co-directs their Summer Institute in Dance; is a Dance Specialist for "Life Lines” Community Arts Project; directs the DPWII program at Brooklyn Arts Exchange and is the Studio Manager at the Center for Performance Research. Her teaching practices have been shaped through residencies at Dickinson College, Hollins University, Booker High School Visual and Performing Arts Center, the American Dance Festival, West Coast Civic Ballet, and the University of Maryland, among others. Her work has most recently been supported through a 2-year residency through Movement Research, a 2015 Gibney boo-koo awardee, and through a Mertz Gilmore Late Stage Production Grant. Her work has been presented throughout the East Coast and abroad at various spaces including Brooklyn Arts Exchange (2013 Space Grantee); Dance Theater Workshop (Fresh Tracks); nEW Festival (2009 AIR); Movement Research at the Judson Church ('09-'16); Danspace Project (DraftWork and Academy Dances); Philadelphia Live Arts Festival (The A.W.A.R.D Show); Franklin Street Works (Showing the Work); Dixon Place (BRINK); Performance Mix Festival ('08, '11, '14, '16); CPR (New Voices in Live Performance and Performance Studio Open House); AUNTS; and the Community Education Center (New Edge Mix). Her interests include Cecchetti ballet, magical thinking, and logic problems. Jen also makes work in collaboration with her brother, James, under the name McGinn & Again (see below). McGinn & Again is a multidisciplinary family art collective initiated by James and Jen McGinn. While maintaining professional autonomy, their working practices often converge on collaborative projects, including but not limited to, generative artistic research, pseudo conceptual theory, and the development of post-contemporary pedagogical platforms. 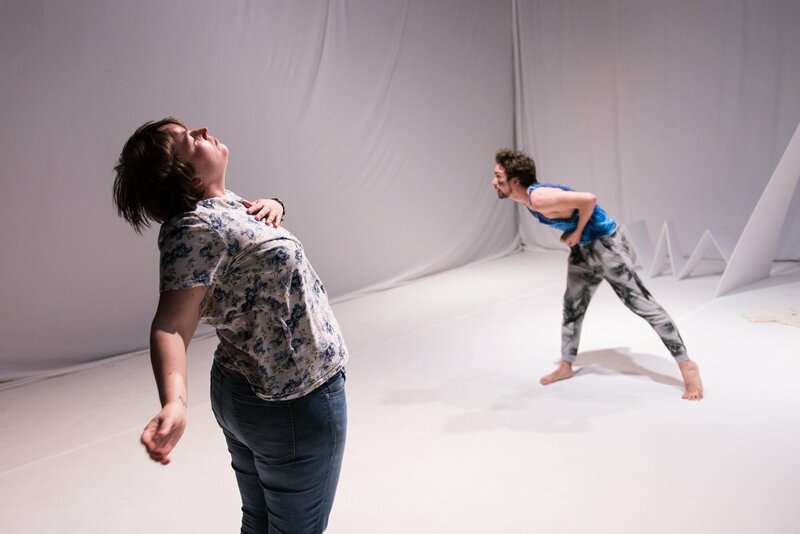 James and Jen have shaped their work through residencies with Movement Research, Gibney Dance, danceWEB@Impulstanz, Brooklyn Arts Exchange, Dance Theater Workshop, and nEW Festival. Their work has been presented recently at American Realness, Performance Mix Festival, Center for Performance Research through Chez Bushwick and Movement Research at the Judson Church. James can be found at www.jamesmcginn.info.